You're eight months pregnant and you're struggling to make it through the working day. Or you've just returned to work after maternity leave and you're finding it difficult to keep it together. Maybe you've requested flexible working arrangements so you can do the childcare pick-up, and your boss doesn't understand her obligations. Maybe you're planning for your second child and you want things to go more smoothly this time around. 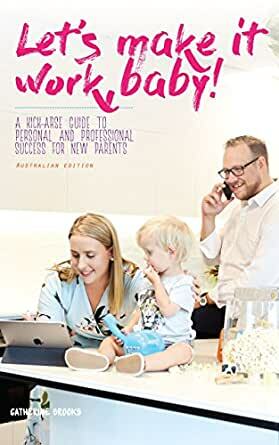 This book provides a reassuring, practical and compassionate guide to dealing with the challenges parents face in juggling work and family, and highlights the stories of Australian parents making it work. Workplace relations specialist and mum Catherine Brooks helps working parents to better understand the joys of flexible work, the options available when it comes to working flexibly, and strategies you can use to negotiate better outcomes for your family and your unique circumstances. Drawing on the real-life stories of parents who work in a variety of ways, Catherine hones in on the practicalities and realities of what it takes to achieve a truly flexible life. An informative and easy to read guide to the minefield surrounding maternity leave and return to work. An essential read for working mums and dads. Highly recommend this great book. 5.0 out of 5 starsSuch a necessary book for new parents! The author writes in a friendly, relatable tone and gives fantastic advice about how to get all your ducks in a row for maternity leave and how to make a smooth transition back to work afterward. This is a great outline that anyone can adapt to his or her own situation.